Each assignment grade defaults to the point value set in the assignment. 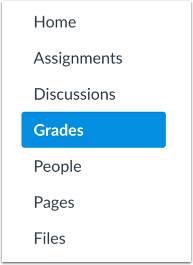 However, the Enter Grades as menu allows you to view the assignment grade to be viewed by percentage. For Letter Grade or GPA assignments, the grade can also be displayed by the grading scheme set for the assignment. 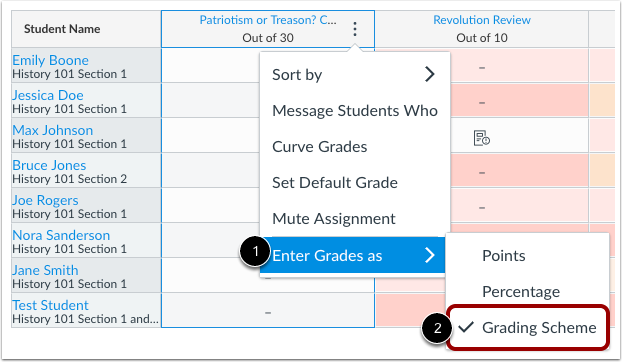 You can change this option before grading in the Gradebook, or if you've graded an assignment from SpeedGrader, you can change the grades display after they've been assigned. The Grade Detail Tray also displays the assignment grade with the preferred Enter Grades as option. Viewing or entering grades using the Enter Grades as option is for grading convenience only and does not affect the actual grade. 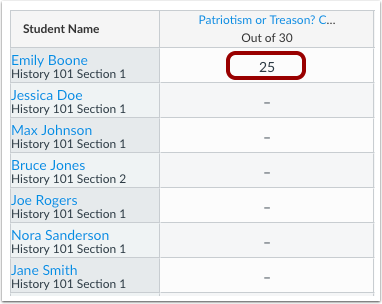 In the student Grades page, students will always view the point value and the default grade display set in the assignment. Point entries display as points (e.g. entering 10 for a 10-point assignment displays as 10 points). Percentage entries are calculated as a percentage but displayed as the equivalent point value of the percentage (e.g. entering 90% for a 10-point assignment displays as 9 points). Grading scheme entries are not supported. Point values are not supported. Entries without a percent symbol are always calculated as a percentage (e.g. entering 20 as a point value calculates and displays as 20%). Percentage entries display as a percentage (e.g. entering 80% for a 10-point assignment displays as 80%). The percent symbol is not required. Grading scheme values calculate according to the assignment's grading scheme and display as the highest percentage for the corresponding range in the grading scheme (e.g. in a grading scheme where B ranges from 84% to &lt;87%, entering a B displays as 86%). Course grading schemes are not supported. Point entries calculate according to the equivalent grading scheme of the point value (e.g. in a grading scheme where B ranges from 84% to &lt;87%, entering 26 for a 30-point assignment calculates as 86.67% and displays as a B). Percentage entries are calculated as percentages but displayed as the equivalent grading scheme for the percentage (e.g. in a grading scheme where A ranges from 94% to 100%, entering 94% displays as an A). Grading scheme values display as the grading scheme value according to the assignment's grading scheme (entering an A displays as an A). Course grading schemes are not supported. Note: The Enter Grades as option is not available for complete/incomplete assignment types. Hover over the assignment title and click the More Options icon. Select the Enter Grades as option  and view the current grade display option . Unless changed, the assignment defaults to the grade display set in the assignment. All assignments display the Points and Percentage options. Additionally, Letter Grade assignments display the grading scheme option. 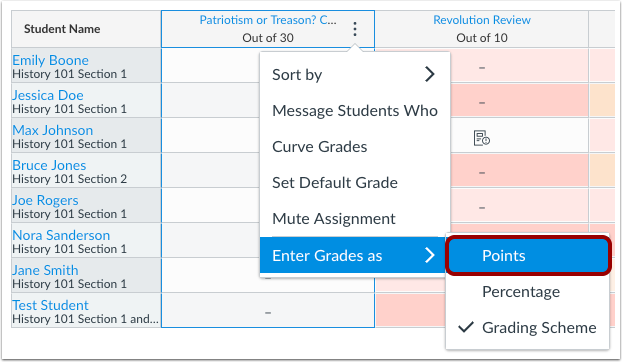 If you want to enter grades and have them display in the gradebook using a different grading value, select your preferred grading display as supported for the assignment. 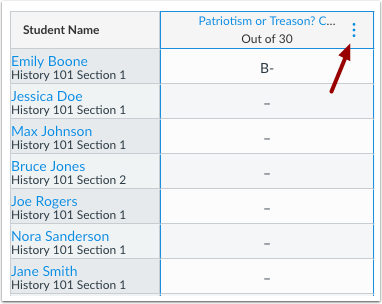 In the assignment column, any existing grades will calculate and display according to your grade display preference. For new grades, enter a grade value according to your grading preference as supported: points, percentage, or grading scheme. The entered grade will be calculated appropriately and displayed according to the grade display option. If you enter a grade that is not validated through the grading scheme, you will see an invalid grade warning message. A warning icon also displays in the cell with the invalid grade. Previous Topic:How do I enter and edit grades in the New Gradebook? Next Topic:How do I get to SpeedGrader from the New Gradebook? Table of Contents > New Gradebook > How do I enter grades for an individual assignment as a specific grading type in the New Gradebook?